That's the conclusion of an article in Al-Arabiya by Sarah Sfeir: "Real estate experts say that the price of a square meter in the commercial area around the holy city, can be up to 375 thousand riyals ($100,000)." As a consequence, high-rise buildings are going up at a feverish pace, especially around the Grand Mosque. A "forest" of tall buildings has emerged next to the holy mosque, built by the Jabal Omar Development Company; it cost more than $5.5 billion dollars. Hilton will soon open its doors there, along with 26 other new hotels, adding 13 thousand additional rooms to the city. … Banque Saudi Fransi (BSF) says that the investment of the government and real estate development companies in Mecca and Medina is estimated to reach $120 billion dollars over the next decade. In Mecca alone, projects worth $20 billion are currently under construction. 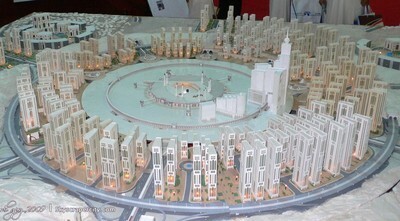 One vision of Mecca's future.